And we’re off! Pope Benedict XVI has officially landed at JFK airport and begun his first official visit to the great city of New York. And what a day for it! It’s going to be 80 degrees out in the afternoon, as he travels around the city in his glass-plated Mercedes-Benz ML430 Popemobile. (We just hope that beast has air-conditioning, because those robes do not look like they breathe.) As we type Benedict is climbing out of Shepherd One, the official papal aircraft, and newscasters are talking about him in the hushed tones that they save for nature documentaries and deadly earthquakes. Later today he’ll address the United Nations, visit a synagogue, and lead a multidenominational prayer service on the Upper East Side. Tonight he’ll be staying in a church-owned townhouse on 72nd Street near Fifth Avenue. And we’ll be here, live-blogging the whole thing. The outfits! The hats! The hilarious asides! The outfits! It will all be here, on this post. We should note in advance that both of your faithful Daily Intel bloggers are Catholic. Why do we point that out? So you know that we’re going to heaven and you’re not! Just kidding. It was so our asses were covered in case we write something totally offensive about His Royal Popeness. (This, unfortunately, calls into question everything we’ve written about Jews in the past, but we digress.) Okay, on to our endless pontification! 10:06: The pope is landing at a downtown heliport on the waterfront. It appears to be the one from which Blair tried to escape in the last episode of Gossip Girl earlier this year. OMG, Queen B and Pope B have had their hair messed up in exactly the same place! If that’s not a message of some kind, we don’t know what is. 10:31: Benedict has arrived at the U.N. He posed for some pictures with Ban Ki-moon, and now everybody is waiting around in the Secretary General’s office for something to happen. It’s funny, when you see all these cardinals together, you realize that their little caps and sashes aren’t exactly the same color of red. They kind of clash. 10:34: Ban Ki-moon and Benedict just exchanged a joke. Everyone around them laughed, but they did not exactly appear to understand one another. 10:47: There was just an exchange of commemorative stamps. No joke: It’s the papal visit, brought to you by the Lincoln Mint. 11:40: OMP, he switched to English! He chose our language for his discussion of the 40th anniversary of the Universal Declaration of Human Rights. “It is easy to forget that they are the fruit of a commonly held sense of justice,” he explains, pointing out that we too often get distracted by the logistics of enforcing and legislating them. It’s a very highly theoretical speech, and we’re having a teensy bit of trouble understanding his accent. Can’t they do that thing that they do on reality television, where they give foreign people subtitles even if they are speaking in English? 11:50: He closes by doing that thing that Popes always do, which is deliver a message of peace and greeting to everybody — in all of their native languages. It gets us every time! He retires to his chair beside the podium, which we just noticed is way bigger than everybody else’s. 12:47: The full text of the Pope’s U.N. address can be found here. 1:28: Someone had a cell-phone cam inside Shepherd One! 3:01: All has been quiet on the Pope front for a while now. He’s chillaxing at the 72nd Street townhouse where he will be spending the night, apparently. He’ll head out again for a visit to Park East Synagogue later in the afternoon. Though we have never before tried to imagine what the Pope does during his downtime, we are now unable to do anything else. 5:20: In what is only the third ever visit by a Pope to a synagogue, Benedict is now hanging out with the Jews at Park East. In fact, at this very moment, a rabbi is explaining publicly to the Pope what the Torah is. (This should be eye-opening.) 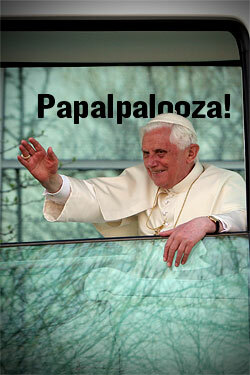 We should note that His Holiness has not changed his outfit once today. Not even a fun Pope hat to tide us over! We mark this as only a slight disappointment, however, because the pontiff-in-a-helicopter moment earlier today was pretty sweet.